• Davantage de Trigger Units sont inclus, rendant les Decks « Tachikaze », « Pale Moon », et « Dark Irregulars » possibles. • Ce set inclut 8 clans différents. Il y a des cartes pour Dark Irregulars, Pale Moon, Tachikaze, Royal Paladin, Oracle Think Tank, Nova Grappler, Dimension Police et Kagero. Thanks to FreedomDuo for the original post. Misaki > Aichi > Kamui…. in a figure 8.
fighter to attack in this fight. All 4 players may draw 1. Thanks to FreedomDuo Vanguard for the rules. A deck may not contain more than 4 of any individual card. A deck must contain exactly 16 Trigger Units. A deck may only contain 4 cards with the Heal trigger. A « Flash Deck » can only have 25 cards total and it can be played in a « Flash Fight » with « Flash Fight Rules ». Your Deck should be placed on one side of the game area. When you Draw a card, you take the top card from your deck into your hand. If you have no cards left in your deck at any point in the game, you lose immediately. The Drop Zone (discard pile) should be a separate pile of cards. When you Retire a card, you move it to the Drop Zone. When you Heal Damage, you move cards from the Damage Zone to the Drop Zone. The Damage Zone is a small stack of discarded cards that must be kept separate from the Drop Zone. Cards in the Damage Zone represent damage to your Vanguard. If there are ever six or more cards in your Damage Zone, you lose the game. The main play area consists of two rows of three spaces. The row nearer the opponent is the Front Row and the other row is the Back Row. The Vanguard Circle is the middle space of the Front Row. It may hold multiple cards in a stack. 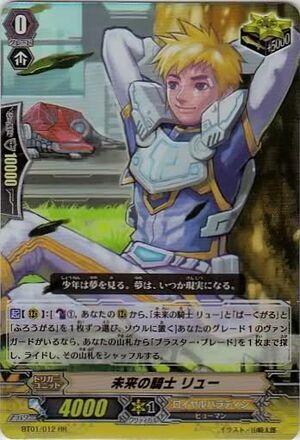 The top card in the Vanguard Circle is your Vanguard. Any cards stacked below it are your Soul. Your Vanguard is not part of your Soul. If there is only one card in the Vanguard Circle, that card is your Vanguard and there are no cards in your Soul. The other five spaces in the main area are Rear-Guard Circles. These can usually only hold a single card each. The Trigger Zone is a temporary area where cards are placed while their effects are being resolved. Its location is unimportant. If you are making a Drive Check, you move cards from your Deck to the Trigger Zone and from there to your hand. If you are making a Damage Check, you move cards from your Deck to the Trigger Zone and from there to the Damage Zone. The Guardian Circle is a temporary area where cards are placed during combat. It is normally located in front of the Front Row. Cards are played here during combat and then retired to the Drop Zone. 1. 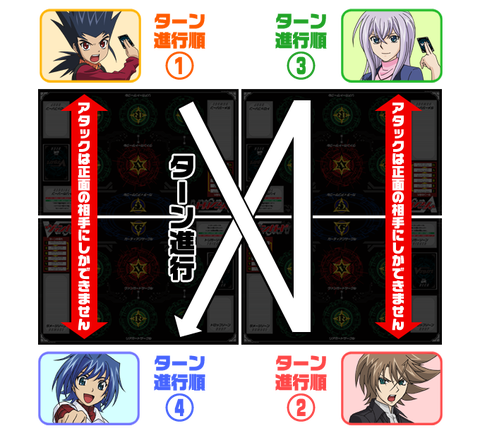 Each player chooses a Grade 0 unit from their deck and places it face-down on the Vanguard Circle. That card will be their first Vanguard. 2. Decide randomly who goes first. The player who goes first cannot attack on their first turn. 3. Both players shuffle their deck and draw 5 cards. 4. Mulligan: If a player doesn’t like their hand, they can discard any number of cards from it back into the deck, reshuffle the deck, then draw new cards until they have 5 cards in their hand again. The new hand must be kept. 5. Both players, at the same time, turn their Vanguards face-up. To win a Cardfight! Vanguard match you must inflict 6 damage to your opponent’s Vanguard. Damage to their Vanguard is represented by cards in their Damage Zone. If a player ever has 6 or more cards in their Damage Zone, they lose. If a player has no cards in deck at any point of the game, they lose. All of your Rested Units return to the position (unless they are prevented from doing so by a card ability). Draw 1 card from your Deck and add it to your hand. If you cannot do this because there are no cards in your deck to draw, you lose. You may place a unit from your hand on top of your existing Vanguard. 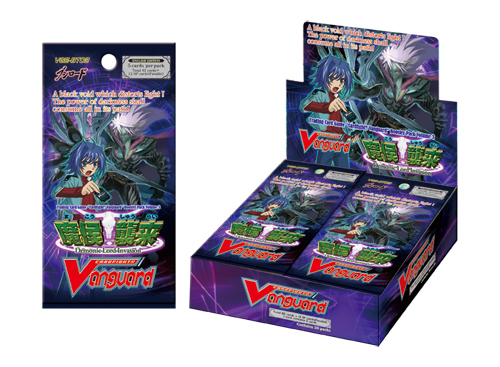 The covered Vanguard card becomes part of your Soul. The new unit must be of the same grade, or one grade higher, than your current Vanguard. You can only do this once per turn. You do not have to Ride if you don’t want to. Riding does not heal any damage to your Vanguard. Place a Unit with a Grade that is either the same as the Vanguard’s or lower in a Rear-Guard circle. You may Call as many times as you want in a turn. Unless stated on the card, there is no cost to Call a unit. You may Call a unit into a Rear-Guard Circle that is already occupied, but if you do, you must Retire the unit already there (ie, move it to the Drop Zone). You can move your Rear Guard units back or forward between the Front Row and the Back Row. Units cannot move from side to side and cannot move into or out of the Vanguard Circle. Thus if a Unit is on the Circle behind the Vanguard, it cannot move at all. Two Rear Guards in the same column may switch places. Card abilities which are described as being used in the main phase can be used at this point. When you have taken all the actions you want to in the Main Phase, the Battle Phase starts and the main phase is over. To initiate an attack select a Standing unit in the Front Row and Rest them . Then declare an Opponent’s Front Row card to be the Target of the Attack (unless otherwise stated on the attacking unit’s card). If you have a card Standing in the Back Row directly behind the attacker you chose, and they have the « Boost » icon, you can also Rest them to add their Power to the Attacker’s Power for the attack. The opponent can Call Guardians from their hand to protect the Unit under attack. The opponent may play any number of cards from their hand to add their Shield power to the power of the unit under attack. The Shield power is found in the yellow square on the left side of the card. Some units have no Shield Power and cannot be called as Guardians. The Guardians must also have a grade equal to or lower than that of your Vanguard. Called Guardians should be placed in the Guardian Circle to keep track of the during the fight. There is no cost to Call Guardians, but all called Guardians will be retired to the Drop Zone at the end of the battle. The opponent may also use the ‘Intercept’ ability (specific to Grade 2). If you have a unit in a Rear-Guard Circle in the Front Row that has the Intercept ability, you may move them from there to the Guardian circle and their Shield will be added to your unit’s power as well. Just like other Guardians, they will be retired to the Drop Zone after the battle. Units with Intercept can intercept even if they are Resting. You cannot Intercept with your Vanguard and thus having an Intercept icon gives no benefit to a Vanguard. If you attacked with your Vanguard, you perform a Drive Check. Reveal the top card of your Deck and place it temporarily in your Trigger Zone. If the card is a Trigger Unit and is of a Clan that is also in your Vanguard or Rear-Guard, then its Trigger effect activates. Regardless of whether the card is a Trigger Unit or not, add the card to your Hand after resolving it. All Trigger Units share a common effect: they give +5000 power to any Unit on the field that the Player selects for the rest of the turn. You may add the power to the attacking Vanguard to attempt to land a hit during the current attack, or to boost other Units. Critical – You add one to the Critical of any unit on the board, until the end of your turn. You may choose to give the Critical and +5000 to different Units. Draw – You draw a card into your hand. Stand – You Stand a Resting Rear-Guard. Heal – You move one card of your choice from your Damage Zone to your Drop Zone if the number of cards in your damage zone is greater than or equal to your opponent’s. If your Vanguard has the Twin Drive icon, two Drive Checks are performed. If a trigger is activated by the first check, the effects of the trigger must be completely resolved before a second trigger is drawn. For example, when a draw trigger is activated, the player draws a card and allocates the damage boost to his units before drawing the second trigger. The Twin Drive icon has no benefit to any unit that isn’t played as a Vanguard. To determine the winner of the Battle compare the total Power of the two cards. If the Attacking unit’s Power is less than that of the Target, the attack fails. The Attacking Unit does not suffer any damage or other penalty. If the Attacking unit’s Power is equal to or higher than that of its target, the attack is a success. If the target was a Rear-Guard, it Retires and is sent to the Drop Zone. The attack is then over. The Critical value of the Attacking unit does not matter if the Target was a Rear-Guard. If the attack was a success and the target was a Vanguard, the opponent must make a number of Damage Checks equal to the Critical value of the attacker. To make a Damage Check, the opponent moves a card from their Deck to the Trigger Zone. If the card is a Trigger Unit and is of a Clan that is also in your Vanguard or Rear-Guard, then its Trigger effect activates. Triggers have the same effect as they do for a Drive Check. The Trigger Unit does not have to be the same Clan as the Target. After the Trigger effect is resolved (if there was one), the card is moved into the Damage Zone. This process is repeated as many times as the attacker has Critical value. Each Trigger must be completely resolved before the next Damage Check begins. If a Damage Check reveals a Trigger Unit that gives a +5000 Bonus to a unit, you can use it on the Target if you want to but it will not change the fact that they have lost the current battle. However, it can protect them against future attacks in the same turn. If a Damage Check reveals a Heal trigger you may move a card from the Damage Zone to the Drop Zone before placing the Trigger Unit in the Damage Zone if the number of cards in your Damage Zone is greater than or equal to your opponents. This means that if you have 5 cards in your Damage Zone and you make a Damage Check and get a Heal Trigger, you may heal damage before placing the card in your Damage Zone and thus avoid it being the sixth card to be placed there. Guardians that were called, or that intercepted, are retired (moved to the Drop Zone). If there are Units on the Front Row that can still attack, you can attack again with them. Declare their targets and repeat the process. Declare the end of your Turn before switching to the Opponent’s turn. • C’est un Deck construit composé de 50 cartes. • Il y a 7 cartes exclusives au Trial Deck et 3 cartes Holo par Deck. 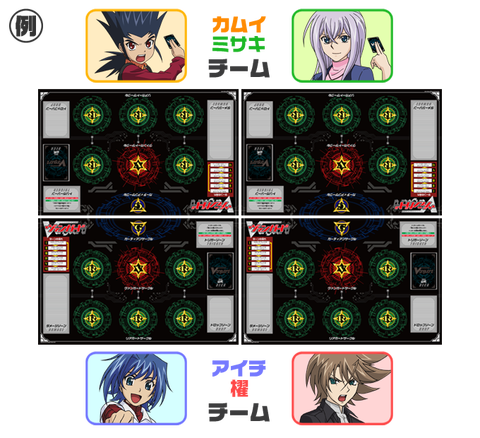 • L’illustration du booster comprend Aichi Sendou, Toshiki Kai et Ren Suzugamori avec Majesty Lord Blaster derrière les trois. • Quelques nouveaux effets permettent les Decks hybrides d’être plus jouables. • Un nouveau clan « Neo Nectar » est introduit. • Plus de Trigger Units sont inclus, rendant les Decks « Murakumo » possibles. • Faire un Deck « Neo Nectar » est également possible. Avant d’aborder la préparation du Deck et le vif du sujet, un résumé sur les différents types de « Units » présents dans le jeu. Nous reviendrons sur les différentes particularités plus tard. – Au centre, le cercle rouge est le cercle du Vanguard. – Les 5 cercles l’entourant sont les cercles de Rear Guard. – A gauche, la Damage Zone, où vous entreposerez vos dommages face recto. – En haut, le demi-cercle vert, c’est la Guardian Zone. Vous y mettrez vos « gardiens » en cas d’attaque. Plus de précisions plus tard. – La Deck Zone, inutile de vous faire un dessin. – La Drop Zone, une sorte de Cimetière. III – Préparer son Deck. Ensuite, la préparation du Deck. Le Deck doit être composé d’OBLIGATOIREMENT 50 cartes, ni une de plus, ni une de moins. Vous ne pouvez pas avoir plus de 4 exemplaires d’une même carte dans le Deck. De plus, vous devez obligatoirement posséder dans le Deck 16 Triggers Units, ni une de plus, ni une de moins, encore une fois. Conseil : En ce qui concerne la répartition des grades, en plus de votre Grade 0 que vous utiliserez en tant que Vanguard, essayez un ratio décroissant, du 0 jusqu’au 3. Exemple : 17 ; 14 ; 11 ; 8. Ce n’est bien entendu qu’un exemple. IV – Conditions de victoire. – L’adversaire ne doit plus être en mesure de piocher une carte dans sa Deck Zone. V – Démarrage du jeu. Avant toute chose, placez un Grade 0 de votre Deck sur votre zone Vanguard, face cachée. Les joueurs piochent 5 cartes. Cette règle très sympathique permet de renvoyer des cartes de sa main dans le Deck, le mélanger, et repiocher le même nombre, au cas où si votre main ne vous plait pas. Entre temps, déterminez au dé ou autre procédé de qui commencera le premier. Déclarez « Stand Up!! » et révélez votre Vanguard. Note : Le joueur qui choisit de commencer ne peut pas attaquer durant le premier tour. VI – Déroulement de la partie. Placez toutes vos cartes en Rest (position paysage, donc horizontale) en Stand (position portrait, donc verticale). Note : On dira, pour faire moins compliqué : Engager, pour Rest, et Dégager pour Stand. Piochez une carte de votre Deck. Vous pouvez placer sur votre Vanguard une Unit dont le Grade est supérieur d’1 ou égal à celui de votre Vanguard. Vous ne pouvez pas faire plus d’un Ride par tour, excepté si certaines de vos Units vous permettent ce qu’on appelle communément un Superior Ride ou bien une Unit qui vous permet de faire un Ride supplémentaire. Voici la liste des actions possibles durant cette phase. Vous pouvez placer une Unit avec un Grade inférieur ou égal à celui de votre Vanguard dans les zones Rear Guard. Vous pouvez faire un nombre de Calls illimité durant votre tour. NB : Vous pouvez Call une Unit avec un Grade supérieur si un effet de carte vous le propose. Par exemple, « Nightmare Doll, Alice ». b. Unit Ability – les effets des Units. Vous pouvez activer n’importe quelle abilité qui vous permettent de le faire en Main Phase. Certaines peuvent et/ou doivent s’activer en Battle Phase. Vous pouvez déplacer une Unit en Rear Guard du haut vers le bas, ou du bas vers le haut. Vous ne pouvez pas déplacer une Unit de la gauche vers la droite et inversement. Vous ne pouvez pas bouger une Unit qui se trouve sous le cercle Vanguard. Engagez votre Unit. Vous ne pouvez sélectionner de cibles que des Units qui se trouvent sur la Ligne de Front de l’adversaire. Lorsque vous vous faites attaquer, vous pouvez Appeler (Call) un Guardian afin de protéger l’Unit avec son effet Shield (voir les points Shield sur la gauche de la carte). Le Shield s’ajoute au Power du Vanguard jusqu’à la fin du combat. Vous pouvez appeler autant de Guardians de votre choix. Lorsque le combat est fini, tous les Guardians appelés sont envoyés dans la Drop Zone. Lorsque l’Unit qui attaque est un Vanguard (peu importe la cible de l’attaque), vous effectuez un Drive Check. – Révélez la carte sur le dessus de votre Deck. S’il s’agit d’un Trigger Unit, et que cette Unit est du même clan que le Vanguard ou une Unit placée en Rear Guard, son effet Trigger s’active et se résout. Cette carte est ensuite envoyée dans la main. d. L’issue de la bataille. L’attaque est un succès si le Power de l’Unit attaquante est supérieure ou égale à la cible. – Si la cible était une Unit en Rear Guard, elle est retirée et est envoyée en Drop Zone. – Le joueur recevant les dommages envoie la même quantité de cartes sur le dessus du Deck au Cimetière, l’une après l’autre. – Ainsi, le joueur procède à un Damage Check, et suit la même procédure que le Drive Check. Déclarez la fin de votre tour avant de passer au tour de votre adversaire. Afin d’activer une capacité Counterblast, vous devez flipper face verso des cartes dans votre Damage Zone. La quantité dépend de l’effet. Le Soul Blast consiste à envoyer un nombre de cartes du Soul à la Drop Zone. Il s’agit d’envoyer une ou plusieurs cartes de votre main à la Drop Zone. 1. Pour qu’un effet de Trigger s’active, vous devez avoir sur le terrain au minimum une Unit du même clan que le Trigger. 2. Un effet de Trigger ne peut pas s’activer de la main. 3. S’il n’y a pas d’icône de Trigger, aucun effet ne se produit. 5. Vous êtes obligés d’activer les effets du Trigger. Lorsque ce Trigger est révélé au cours d’un Drive ou d’un Damage Check, choisissez l’une de vos Unit et celle-ci gagne un bonus de +5000 à son Power, puis vous piochez une carte. Lorsque ce Trigger est révélé au cours d’un Drive ou d’un Damage Check, choisissez l’une de vos Unit et celle-ci gagne un bonus de +5000 à son Power. Choisissez une nouvelle fois une Unit (la même si vous voulez) et elle gagne 1 en Critical. Lorsque ce Trigger est révélé au cours d’un Drive ou d’un Damage Check, choisissez l’une de vos Unit et celle-ci gagne un bonus de +5000 à son Power. Si votre nombre de dommages est supérier ou égal à celui de votre adversaire (cette carte exclue), vous pouvez récupérer un point de dommage en remplaçant cette carte avec l’une de vos cartes en Damage Zone. La carte remplacée va en Drop Zone. Vous ne pouvez pas placer plus de 4 Heal Triggers dans un Deck. Lorsque ce Trigger est révélé au cours d’un Drive ou d’un Damage Check, choisissez l’une de vos Unit et celle-ci gagne un bonus de +5000 à son Power. Sélectionnez une Unit en Rear Guard et dégagez-la. Les Units de Grade 0 et 1 ont cette abilité. Lorsqu’une Unité déclare une attaque avec un Grade 0 ou 1 derrière, vous pouvez engager cette Unité et ajouter son Power à l’Unité attaquante. Les Units de Grade 2 possèdent cette capacité. Lorsque d’autres Units sont attaquées, vous pouvez déplacer cette Unit en Guardian Zone. Puis, elle est traitée comme si elle avait été appelée en Guardian. Les Units de Grade 3 ont cette particularité. En tant que Vanguard, elles peuvent faire deux Drive Checks. a. [永] = [Continu] : Cette abilité est activée tant que l’Unit est sur le terrain. Vous ne pouvez pas choisir de ne pas l’activer, sauf si c’est précisé. b. [起] = [Déclenchable] : Cette abilité peut être seulement activée en Main Phase. Vous pouvez choisir de l’activer ou non. Vous pouvez l’activer plusieurs fois sauf si l’inverse est précisé. c. : Cette abilité est obligatoire et s’activera tant que les conditions seront remplies. Vous pouvez choisir d’activer cet effet ou non, seulement si « Vous pouvez/You may » est écrit dans le texte. Voilà, tous les détails du jeu n’ont désormais aucun secret pour vous, l’avantage actuellement c’est que vous n’avez pas de rulings pour vous faire ch*er. Note pour le jeu : Pour des raisons qui font que la situation serait vite en défaveur de l’adversaire, la carte « Barkgal » (Grade 0/Royal Paladin) ne peut pas être utilisée en tant que Vanguard de départ. Merci à FreedomDuo Vanguard pour les règles. Merci à Lapiroth (www.cardfightvanguard-fr.com) pour la traduction des règles. 1. Former une équipe de deux. 2. Chaque joueur doit avoir un Deck. 3. Ne pas discuter ou regarder la main des autres joueurs durant la partie. -L’équipe ayant un total de 9 Damages ou plus perd la partie. -L’équipe dont le deck d’un des joueurs à 0 card perd la partie. 1. Chaque joueur a son propre terrain mais la Damage Zone est partagée par l’équipe. Ex : Le joueur de droite peut utiliser les Damage du joueur de gauche. Ex : Pour activer un Heal Trigger, les totaux des Damages des équipes sont comparés au lieu des Damages individuels. Ex : Le Limit Break s’activent par rapport au total des Damages de l’équipe. 3. Quand un joueur subit une attaque, son équipier peut Call une Unit de sa main pour aider. L’Intercept n’est pas autorisé. 4. Les coûts de Counterblast et de SoulBlast sont partagés entre les membres de l’équipe. Ex : Pour le Soulblast 5 de Soul Savior Dragon le joueur peut Soublast 3 de sa propre Soul et soublast 2 de la Soul de son équipier. 1. Les 4 joueurs décident le premier a commencer (pierre-papier-ciseaux). 3. Les 3 premiers joueurs ne peuvent pas attaquer. Toujours dans le cas ci-dessus, Aichi serait le premier a pouvoir attaquer. 1. [Your] fait référence au joueur qui utilise cette Unit, son équipier ne peut donc en être la cible. Le Joueur ne peut donc pas utiliser son skill pour défendre une Unit de son équipier. L’équipier de l’adversaire du joueurs peut donc Guard avec ses propres G0. 2. [All players] Cible TOUS les joueurs. Les 4 joueurs piochent donc une carte. • Le nouveau clan « Shadow Paladin » est introduit. • Le premier booster qui n’introduit qu’un seul clan et apporte du support pour 5 autres clans existants à la place. • Plus de Trigger Units sont introduits, rendant les clans « Shadow Paladin », « Dimension Police » et « Megacolony » jouables. • La première carte (Phantom Blaster Dragon) à avoir un artwork alternatif pour sa version SP depuis l’extension Descent of the King of Knights est incluse dans cette extension.